Publication details: Book. 1999. xii and 541 pages. Publication date: 1999-12-23. 233 figures of which 6 in color, and 70 tables. 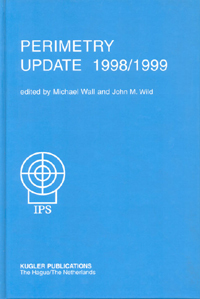 Perimetry Update 1998/99 contains a selection of papers and posters presented at the XIIIth Visual Field Symposium of the International Perimetric Society. This peer-reviewed volume provides a convenient source for most of the perimetric research presently being undertaken world-wide. The XIIIth. Symposium took place between September 6th and 9th, 1998, at the Grand Hotel, Gardone Riviera, Italy, hosted by Professor Enrico Gandolfo of the University of Brescia, and was attended by over 250 delegates. The setting for the Symposium, on the shore of the picturesque Lake Garda, provided an idyllic location for the scientific sessions of the Symposium and for the social functions of the Society.